Polbase - Reference: Structural mechanism for coordination of proofreading and polymerase activities in archaeal DNA polymerases. Structural mechanism for coordination of proofreading and polymerase activities in archaeal DNA polymerases. A novel mechanism for controlling the proofreading and polymerase activities of archaeal DNA polymerases was studied. The 3'-5'exonuclease (proofreading) activity and PCR performance of the family B DNA polymerase from Thermococcus kodakaraensis KOD1 (previously Pyrococcus kodakaraensis KOD1) were altered efficiently by mutation of a "unique loop" in the exonuclease domain. Interestingly, eight different H147 mutants showed considerable variations in respect to their 3'-5'exonuclease activity, from 9% to 276%, as against that of the wild-type (WT) enzyme. We determined the 2.75A crystal structure of the H147E mutant of KOD DNA polymerase that shows 30% of the 3'-5'exonuclease activity, excellent PCR performance and WT-like fidelity. 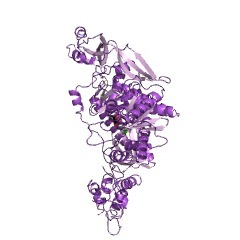 The structural data indicate that the properties of the H147E mutant were altered by a conformational change of the Editing-cleft caused by an interaction between the unique loop and the Thumb domain. Our data suggest that electrostatic and hydrophobic interactions between the unique loop of the exonuclease domain and the tip of the Thumb domain are essential for determining the properties of these DNA polymerases.